Abstract: Due to their clearly imaginary narratives and to the presence of animation itself, animated mockumentaries make the viewer aware of their fictionality from the start. Therefore, these animated works constitute the clearest example of mockumentary being not a genre, but rather a narrative style capable of transcending the boundaries of genres, media, and individual poetics. Through the analysis of Ash Brannon and Chris Buck’s feature film, Surf’s Up (2007), and of The Simpsons’ episodes “Behind the Laughter” (Mark Kirkland, 2000) and “Springfield Up” (Chuck Sheetz, 2007), in this article I argue that the mockumentary style does not consist solely in the adoption of documentary aesthetics and structures, but also in the deployment of elements (such as booms left “accidentally” in view, glances in the direction of the camera and so on) that I will call fictionality clues. I will demonstrate that, whereas in hoaxes or credible live-action mockumentaries the presence of these hints might be dismissed as due to the need of alerting the viewer to the film’s effective ontological status, in the case of animated mockumentaries they would be redundant, if used just for this purpose. Thus their occurrence in these works suggests that they are central to the mockumentary as a form. When examining the crossover of animation and documentary, scholars tend to take into account almost exclusively the so-called animated documentary, thereby inadvertently suggesting that the latter is a synonym of the former and not just one of its possible outcomes. This is, for instance, what Paul Ward unintentionally conveys in the fifth chapter of his Documentary: The Margins of Reality when he sets out to broadly tackle “the relationship between documentary and animation” (82), but then focuses solely on the use of animation to recount factual occurrences (82–99). The same idea is indirectly suggested also by Annabelle Honess Roe when, in the opening of her book Animated Documentary, she underlines that “the history of the hybridisation of animation and documentary … stretches back to the earliest days of the moving image”, only to immediately centre her attention on the animated documentary (1). As a consequence, the latter is coming to be conceived as the animation-documentary cross-breed par excellence. Yet, it must be acknowledged that it is not the only hybrid form that can spring from the cross-pollination of these two opposites. Indeed, if over the past two decades animation has increasingly been employed to recount real-life events,  at the same time we have also witnessed the flourishing of fictional animated works bearing the semblance of documentaries, known as animated mockumentaries. The hybrids belonging to this second category can either combine animation and live action or, more frequently, be entirely animated. Examples of the first include South Park’s (Trey Park and Matt Stone, 1997–present) special episode “Chef Aid: Behind the Menu”(Jennifer Heftler and Lisa Page, 1998) and Alan Shannon’s TV series Roy (2009–present), which purport to document, respectively, the career of Park and Stone’s animated sitcom’s protagonist Jerome “Chef” McElroy and the daily routine of a roughly drawn animated figure named Roy O’Brien, supposedly the first cartoon character born to a live-action Dublin family. Examples of entirely animated mockumentaries are, instead, J. Zachary Pike’s award-winning short The Toll (2006), Josh Selig’s feature Meet the Small Potatoes (2013) and Jack Bennett’s Stickman (2013), a 12-minute film chronicling the life of Stick Stickman, purportedly the world’s first cartoon character. Precisely because these texts’ fabricated and fantastic nature is the attribute that overrides all others, the documentary codes and conventions they display are deprived in the eyes of the spectator of their inherent veridictive value and are reduced to merely the “look” of the narrative. Thereby, such animated hybrids do not prompt the viewer to put in place that negotiational process on their ontological status, which has come to be considered a peculiar trait of mockumentary, and which consists in inducing the spectator to initially establish “a contract of veridiction” (Bettetini 94) with the audiovisual text (i.e. to adopt a factual mode of reading), only to then encourage him or her to renegotiate such communicative pact in favour of a fictional one—of a fictional mode of reading (Jost 36–7)—by progressively disclosing the film’s fictive nature. As a consequence, we could be induced to dismiss these works as anomalous products not worthy of scholarly attention; on the contrary, exactly by virtue of their peculiarity, they corroborate Jane Roscoe and Craig Hight’s statement that “the attempt to discuss mock-documentary in purely generic terms would neglect key characteristics of these texts—in particular the very fluid nature of the form” (Faking It 183). Indeed, as Roscoe and Hight have argued, conceiving the mockumentary as a genre “would ultimately lead us to obscure the diversity of textual strategies which fall under this umbrella, and to diminish the shifting nature of the form” (183). This becomes evident when we consider how much mockumentaries can differ among them in terms of modes of representation, degree of fictionality, type of plot, fiction genre with which they intertwine, typology of clues adopted in order to hint at their fictive status, and so on (Formenti 23–99). For instance, under the mockumentary label fall such diverse films as the comedic The Rutles: All You Need Is Cash (Eric Idle and Gary Weis, 1978), which pretends to chronicle the career of an imaginary rock band by reproducing the structures and aesthetics of what Bill Nichols refers to as the “expository mode” of documentary filmmaking (31), and the dramatic horror feature The Blair Witch Project (Daniel Myrick and Eduardo Sánchez, 1999), in which shaky handheld camerawork, synchronous sound and natural lighting are exploited so as to give the impression that the footage was indeed recorded by the two diegetic cameras. It thus becomes clear not only how dissimilar the cross-breeds classifiable as mockumentaries are, but also that, in contrast to what has been suggested by Alexandra Juhasz, the mockumentary cannot be simply referred to as “a special breed of parody” (2). Animated mockumentaries also disprove that the best way of conceiving the mockumentary is as a “complex discourse”, as Hight describes it by recouping Nichols’s definition of documentary and reconceptualising it “as a frame for approaching the broader field of documentary culture” (Television Mockumentary 17). Indeed, these animated works foreground instead the idea that the most appropriate definition for the mockumentary is that of a “collective” narrative style, i.e. a style that is not the emanation of a single author’s vision, but rather “of a homogeneous multiplicity”, of “a shared cultural horizon”, which can either be “national, linked to a specific time period, to an historic era, or transnational” (Bertetto 82; my translation). In particular, as we will see, the mockumentary appears to be a narrative style that not only transcends the boundaries of individual poetics, but also those of genres and media. It must be noted that with “style” I here refer not simply to a catalogue of diverse shots and editing typologies, but rather to a “complex and stratified system, wherein both technical-linguistic elements (such as typology of shots, editing, lighting) and non-linguistic (that is to say, narrative, iconographic, thematic and pragmatic) elements interact” (Buccheri 38; my translation). Hence, the notion of style is here understood in a broader sense than as a specific kind of filmic grammar being adopted. Indeed, the mockumentary style does not consist solely in the deployment of documentary aesthetics and structures, but also in a number of (often nonlinguistic) elements, which I will call fictionality clues, and which are aimed at hinting at these audiovisual products’ effective ontological status. What is noteworthy is that their presence in these animated films would be entirely unnecessary, if the sole purpose of their employment was that of flagging the already evident fictiveness of such texts. In order to demonstrate the foregoing, I will now look closely at the exemplar cases of Ash Brannon and Chris Buck’s Surf’s Up (2007) and of The Simpsons’ (Matt Groening, 1989–present) episodes “Behind the Laughter” (Mark Kirkland, 2000) and “Springfield Up” (Chuck Sheetz, 2007). Produced by Sony Pictures Animation, Surf’s Up has been the first feature-length animated mockumentary. More specifically, this CGI movie pretends to be an observational documentary on the attempt of the 17-year-old Rockhopper penguin Cody Maverick to win a legendary surf championship: the Big Z Memorial Surf Contest. Thereby, exactly as it would happen in a live-action mockumentary, the film was endowed with the semblance of a factual product by means of a vast array of those codes and conventions which we are so accustomed to seeing used in a documentary that they “have in themselves become part of our everyday common sense understandings” of it (Faking It 17). In particular, taking advantage of a specially developed camera system capable of capturing the motion of a physical video camera, the animators have integrated in the film techniques usually associated to the idea of unmediated reality, such as quick zooms, shaky handheld camerawork and abrupt camera movements (16). Furthermore, the movie includes throughout talking-head interviews complete with captions that inform us about the identity and profession of the interviewees, photographic stills portraying one of the protagonists, and news feeds of the surf contest created in the fashion of the U.S. television channel ESPN’s sport events coverage. Additionally, Surf’s Up also showcases mock-archival footage crafted so as to give the impression that the various excerpts pertain to different decades. In order to do so, once created, the shots were digitally bleached out and/or aged “with CG dust, scratches and penguin feathers” (Robertson 14). Figure 1: Mock-news feed of the Big Z Memorial Surf Contest replicating the aesthetics of ESPN sport events’ coverage. Surf’s Up (Ash Brannon and Chris Buck, 2007).Sony Pictures Home Entertainment. 2007. Screenshot. 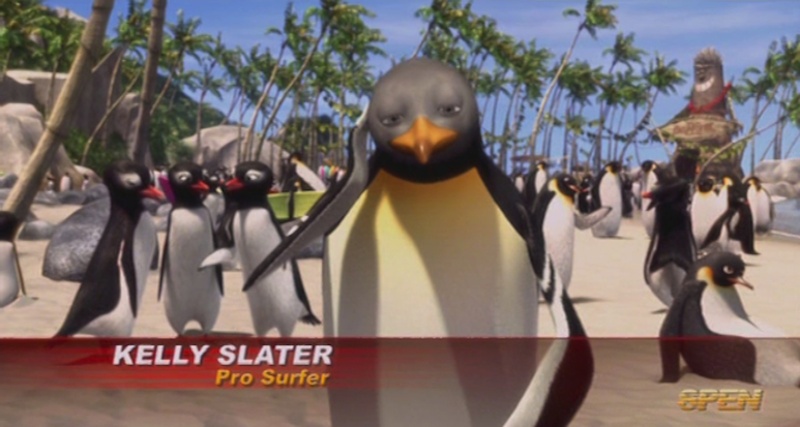 Figure 2: Mock-archival footage of the first penguin to become a surf champion from Surf’s Up. Sony Pictures Home Entertainment. 2007. Screenshot. In a live-action mockumentary each of these codes would normally fulfil a specific veridictive function. For instance, the news feeds would accomplish the task of certifying that such occurrences have indeed taken place and, at the same time, of demonstrating that they have generated “interest” to the point of obtaining media coverage (Colombo 53; my translation), whereas the interview-testimony of an eyewitness, by providing us “with a direct link to a particular event” (Faking It 16), would function as a validation that the data provided on such event is reliable. Combined together, these aesthetics would work to make the narrative credible as a truthful account of occurrences pertaining to our world. Yet, here the presence alone of fabricated penguins with human-like features is overriding. Consequently, the viewer will opt from the start for a “fictionalizing reading” of the text (Odin 228). In other words, he or she will put in place five operations, namely the “construction of a diegesis”, the “narrativization”, the “mise en phase”, the “construction of an absent Enunciator” and, most important of all, the “fictivization”, which consists in attributing “a fictive origin” to the absent Enunciator and is thus incompatible with a “documentarizing reading” (228–29). As a consequence, the spectator will end up dismissing this animated feature’s documentary aesthetics as merely the form through which the story is told. This finds validation in how such codes and conventions are discussed by film critics, who, according to what stated by Roscoe and Hight, would constitute the best possible typology of spectators for a mockumentary, due to their being “knowing and media-literate” viewers (Faking It 52). For example, in reviewing Surf’s Up for Sight & Sound, Andrew Osmond refers to these aesthetics as the “framing” of the story (78), whereas Robertson, in an article for the magazine Animation, speaks of “documentary style” (14). Interestingly, such a manner of conceiving the factual production’s aesthetics showcased in the movie is consistent with the intentions of its two directors. Indeed, production designer Paul Lasaine has explained: “We didn’t want people to wonder if we used real penguins, but if the world of Surf’s Up is a documentary, getting the look of a documentary was very important” (qtd. in “Surf’s Up” 25). Consequently, it was decided to avoid adopting a photorealistic approach, aiming instead at creating the film’s universe only “near reality” (Lasaine qtd. in “Surf’s Up” 25). So, if in animating this feature, on the one hand, the fundamental rules of physics and gravity have been respected,  on the other hand, real-world dynamics have been pushed to caricature. That said, what emerges is that, both in the intents of the filmmakers and in how they are received by a special set of viewers (namely, the film critics), the documentary aesthetics here deployed are understood simply as the form through which a traditional fictional story is told. In other words, they are seen as a narrative style. And, in effect, if we look closely at the film, we will notice that the documentary codes and conventions in it arrayed are nothing other then a patina underneath which we can identify fiction filmmaking’s traditional narrative devices. For instance, the archival footage excerpts (and on a smaller scale also the photographic stills) are nothing other than flashbacks that provide us with data essential for our understanding of the story. 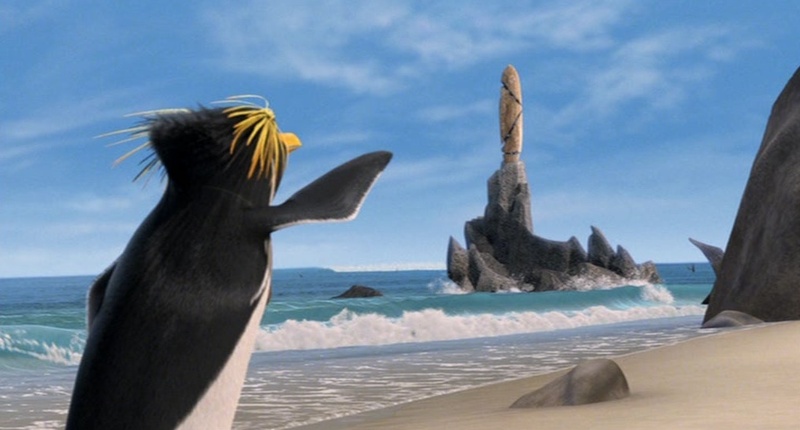 A clear example is traceable in the scene, set on Pengu Island’s beach, wherein Cody sees for the first time the monument there erected in memory of Big Z. Here we initially have a two shot of Chicken Joe giving advice to the young surfer on how to conquer the heart of the beautiful female penguin Lani. All of a sudden, however, the sight of Big Z’s shrine distracts Cody, who runs in the direction of the monument. Following the young penguin’s movement, the camera quickly pans to reveal the memorial. Subsequently, with a cut away, we are offered an insert shot of the shrine that ends in a fade-out to the first of a series of aged frames concerning Big Z’s apparent death, which take us to the past. At the same time, sound-wise, we hear Cody ask Joe: “Remember?” After this, archival footage of Big Z’s accident, inserts of the front page of the imaginary Surfer’s Weekly on the legendary athlete’s death and shots attesting his fans’ grief unfold on screen, while a voice-of-God narrator informs us that the tragedy occurred to Big Z resulted in the victory of the actual champion, Thank Evans. Ultimately, with another cut out we are back in the present day, wherein the aforementioned Evans, who is the villain of the story, is shown throwing stones against Big Z’s shrine at the dismay of Cody. 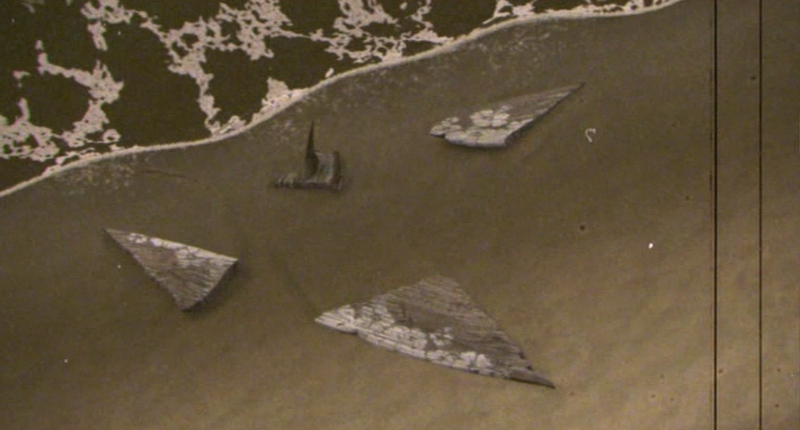 Figure 3 and 4: Cody while spotting Big Z’s shrine, and a mock archival shot showing Big Z’s destroyed surfboard. Surf’s Up. Sony Pictures Home Entertainment. 2007. Screenshots. In effect, as pointed out by Robertson in an article published in Animation,Brannon and Buck’s film recounts “a classic story” (12) which, as reiterated by Film Journal International’s reviewer Ethan Alter, “has been told countless times in kids’ movies” (103). Indeed, Surf’s Up narrates the tale of an outcast with dreams of glory, who gives up his soon-to-be victory to the advantage of a friend. Furthermore, the movie clearly signals throughout who the heroes are and who the villains, and it ends with an edifying moral in the tradition of Aesop’s Fables, which, as noted by Maureen Furniss, “is one of the major sources of traditional literature used in animation production” (114). In particular, the not-so-unusual message that “winning isn’t everything” is conveyed here (Alter 102). Moreover, along the lines of classical Disney animated features such as, for instance, Bambi (David Hand, 1942), Cinderella (Clyde Geronimi, Hamilton Luske and Wilfred Jackson, 1950) or the more recent The Lion King (Roger Allers and Rob Minkoff, 1994), whose protagonists all undergo the trauma of loosing one or both parents, it is recounted that Cody’s father was killed by a shark. Additionally, the film was released in 2007, just a year apart from George Miller’s Happy Feet (2006) and two years from Lu Jaquet’s La Marche de l'empereur (March of the Penguins, 2005) and Eric Darnell and Tom McGarth’s Madagascar (2005), all penguin movies exactly as Surf’s Up. 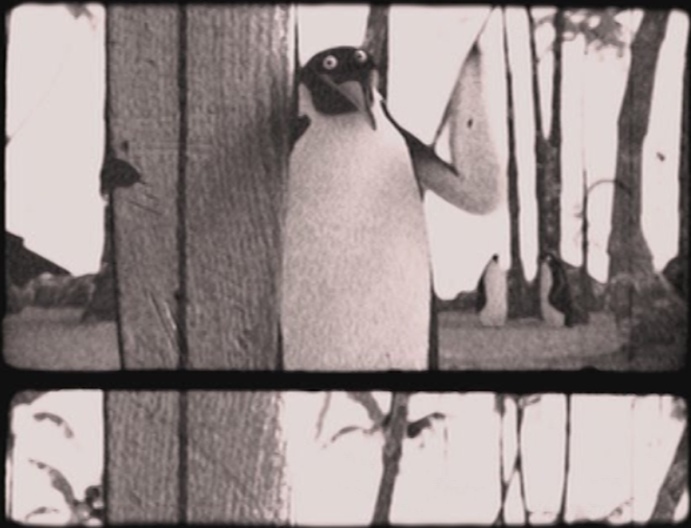 This animated feature was thus distributed in a period when the penguin movie genre had been exploited to the point that most film critics opened their reviews of Brannon and Buck’s mockumentary with sentences like: “Ever since Luc Jacquet’s endearing documentary March of the Penguins persuaded Hollywood that penguins are the new Bambis, we have endured singing, wisecracking and even tap-dancing versions. Now, treading eagerly on the flippers of last year’s Happy Feet, comes Surf’s Up, a computer-animated comedy featuring birds on boards” (Catsoulis). Or again: “What is it about penguins that attracts documentarists and animators so much?” (“These Surfer-dude Penguins” 32). In particular, many commented upon the decision of releasing Surf’s Up so close in time to Happy Feet. For instance, the incipit of Peter Debruge’s article reads: “Just when parents managed to calm their tap-dancing tots, along comes another animated penguin pic—this time featuring South Pole fowl who surf” (20). Similarly, Osmond has written in Sight & Sound: “The heart sinks at the prospect of another CGI cartoon about precocious penguins so soon after Happy Feet” (78). Yet, these statements are followed by the reviewers’ praise for the innovativeness of Brannon and Buck’s movie, precisely in virtue of its mockumentary style. For instance, this is what “gives the film a lift” (9) and renders it surprisingly “fresh” (102), according to Independent’s Antony Quinn and Film Journal International’s Ethan Alter respectively. If the example of Surf’s Up already clearly shows how the mockumentary is best conceived as a narrative style, this is rendered even more evident by the two The Simpsons episodes “Behind the Laughter” and “Springfield Up”. As Hight notes, “The Simpsons’ regular complex narrative style arguably incorporates a number of mockumentary elements, including mock news programmes, educational and public relations films and occasional clip programmes presented by ‘actor Troy McClure’ (Phil Hartman)” (Television Mockumentary 190). Yet, the two episodes here considered differ from the rest in virtue of their being entirely constructed as documentaries. 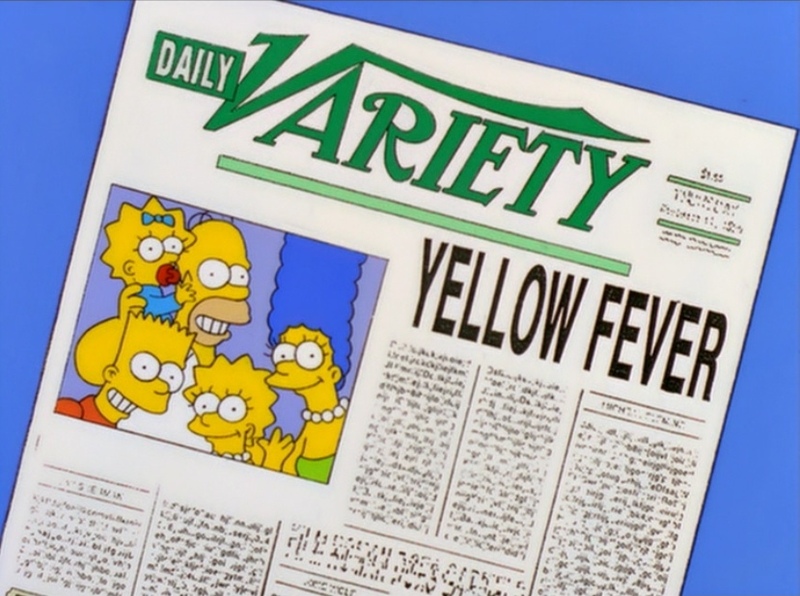 Figure 5 and 6: Mock home footage of baby Lisa, and a mock front page of Variety praising the Simpsons family. “Behind the Laughter” (Mark Kirkland, 2000). The Simpsons: The Eleventh Season. 20th Century Fox Home Entertainment. 2008. Screenshot. In particular, the first, which was originally aired in 2000 as season finale of the eleventh series, is modelled on the factual VH1 TV program Behind the Music (1997–2004). Only here, instead of a musician or a band, the Simpsons clan is profiled by documenting the ups and downs of each family member’s career, as if these animated characters where real-life actors. It is important to note that, in this case, Matt Groening’s team hasn’t simply reproduced the generic codes and conventions of a set documentary mode of representation, but it has also deployed the aesthetics of the specific factual series referenced. Indeed, two arrays of veridictive marks are showcased. On the one hand, we find those broadly proper of the “expository mode” (Nichols 31), which is the mode of documentary filmmaking here mimicked, such as a voice-of-God narrator, archival footage, interviews with eyewitnesses and what Colombo would call “exhibits” (50; my translation)—that is to say elements which bestow concreteness and relevance to these figures (for example, newspaper front pages providing an account of the family’s success, or albums it is pretended they have recorded). On the other hand, throughout the episode aesthetics peculiar to Behind the Music are also reproduced, such as the voice of its regular narrator Jim Forbes, or this factual series’ graphic package, which has been mimicked very closely thanks to the help of the VH1 teem itself. Figure 7 and 8: “Behind the Laughter”’s graphic package compared to that of the series Behind the Music. The Simpson. 20th Century Fox Home Entertainment. 2008. “Metallica.” Behind the Music. VH1, 1998. Screenshots. Part of the eighteenth season, “Springfield Up” purports instead to chronicle the changes occurred over time in the lives of selected Springfield residents, among which there obviously are Marge and Homer. In particular, the episode mimics the British factual TV series Seven Up (Paul Almond; Michael Apted, 1964–present) by pretending that a documentary filmmaker visited these “persons” every eight years, since they were aged 8. Even more precisely, “Springfield Up” replicates the structure adopted from the episode “28 Up” (Michael Apted, 1984) onwards, which envisaged telling “the stories of individual interviewees separately, whereas before they had been edited together, often contrapuntally, to foreground distinctions between the children” (Bruzzi, New Documentary 88). The choice of mimicking specifically such format can be easily explained by the fact that, as Stella Bruzzi outlines, it was only starting from “28 Up” that Apted’s series was taken to the U.S. (89). Hence, this was the sole structure that the American audience actually associated with the Seven Up series. It must however be noted that, if “Behind the Laughter” imitates its model faithfully, there is instead a substantial difference between “Springfield Up” and Apted’s series. Indeed, the latter is discussed by Bruzzi as a “largely observational” documentary that inserts itself “within the tradition of American cinéma vérité, alongside the documentaries of Frederick Wiseman, for instance” (New Documentary 86). Indeed, according to Bruzzi, Seven Up not only quintessentially abides “by the notion of documentary filmmaking as following action and argument rather than prompting or creating them” (86), but also shares observational documentaries’ same “overriding interest in ordinary lives” (Seven Up 33). “Springfield Up”, instead, due to the fact that the filmmaker, who, in the fiction, is attesting the developments in the protagonist’s existences is an out-and-out character of the episode, inscribes itself in the “participatory mode”, whose characteristic is precisely that of emphasising “the interaction between filmmaker and subject” (Nichols 31). That said, like “Behind the Laughter”, also this second The Simpsons’ mockumentary episode is entirely structured as a documentary. Thereby, Groening’s team has consistently deployed in it veridictive marks, such as exhibits, interviews with eyewitnesses, and black and white footage, which is normally assumed by the spectator “to be ‘original’, because manipulation is a recent phenomena [sic] associated with the development of certain digital technologies” (Faking It 17). Moreover, as noted for Surf’s Up, both episodes are animated in the respect of physics and gravity’s principal laws, something that characterises the entire series. In effect, as highlighted by Jason Mittell in his essay “Cartoon Realism”, unlike what normally happens in cartoon shows, throughout The Simpsons when the characters hit the ground “they actually get bruised and bloody” (19). However, despite all the foregoing, even more than in the case of Surf’s Up, when watching “Behind the Laughter” and “Springfield Up” the viewer cannot but be induced to opt immediately for a “fictionalizing reading” (Odin 228). Nichola Dobson partly underscores the main reason for this when she writes: “Clearly, characters that have yellow skin and pointy hair cannot be considered to be ‘like the real’” (89). Yet, these two episodes do not only star yellowish cartoon characters, they star yellowish animated figures that the viewer is accustomed to consider as pertaining to an imaginary world, in virtue of the fact that they have always been presented to him or her as the protagonists of a fictional series. 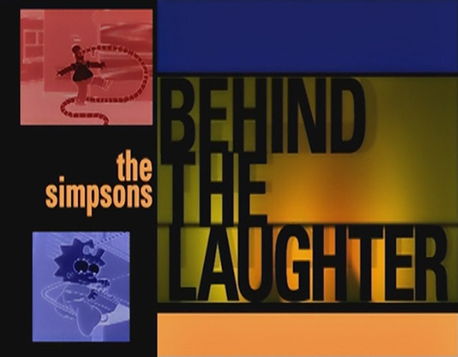 And, as if this wasn’t enough, both episodes open with the animated sitcom’s usual credit sequence, which in the case of “Behind the Laugher” is even followed by the show’s customary couch gag. Thereby, it is immediately suggested to the viewers that they shouldn’t approach these episodes any differently then they do the others of the series. 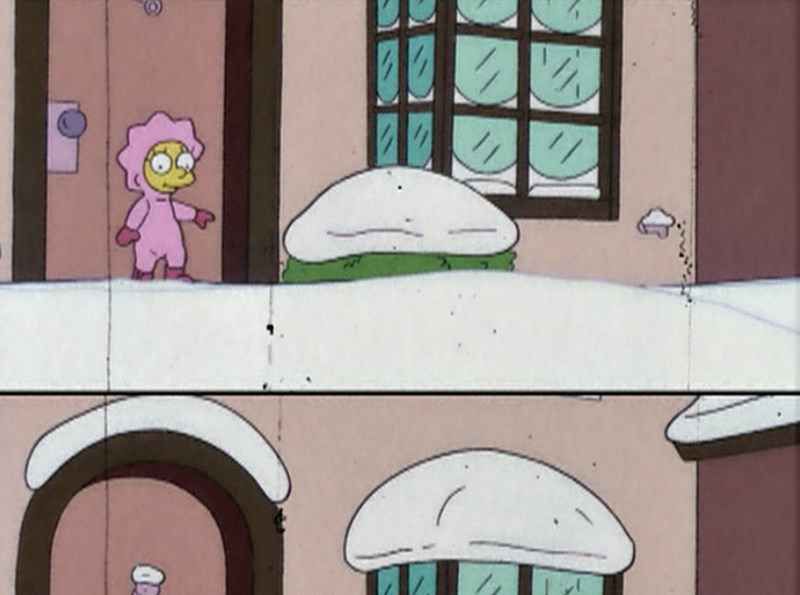 Figure 9: “Behind the Laughter”: couch gag. The Simpsons:The Eleventh Season. 20th Century Fox Home Entertainment. 2008. Screenshot. So, it is once again confirmed that the most suitable definition for the mockumentary is indeed that of a narrative style. Yet, “Behind the Laughter” and “Springfield Up” also demonstrate that it is a style whose evolution is intertwined with the changes that occur in our conception of what aesthetic choices are received as a veridictive mark. Indeed, as noted earlier, these two The Simpsons episodes do not just replicate generic and long-established documentary codes and conventions, but also aesthetics proper of specific televisual factual products, which have come to be conceived as veridictive marks only in more recent times. Their presence can undoubtedly be read in relation to this cartoon’s characteristic reflexivity towards the medium that hosts it, which is expressed through parodying both the televisual production in general and this animated sitcom itself (Mittell 25; Hight, Television Mockumentary 191). Indeed, as outlined by Chris Turner, The Simpsons series’ humour is manly “referential” (450). 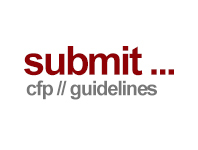 Yet, the use of such codes and conventions can be viewed too as a manifestation of mockumentary being a collective narrative style, not only in the more common sense that it oversteps the boundaries of a single author’s poetics or of a specific genre, but also in that it is employable in a variety of different media and, thus, that it is an intermedial style. In other words, their deployment can be seen as an exemplification of how this form can easily be adopted within different media contexts, just by replicating the aesthetics and structures recognised as veridictive marks of that particular medium. This fact is also proved by such style’s history. Indeed, as Roscoe and Hight point out in Faking It, the first mockumentary is considered to be a radio program: Orson Welles’s 1938 famous hoax, “War of the Worlds” (78–9). Examples of these hybrids have started to appear on television in the 1950s, and subsequently on the big screen around the mid-1960s (Formenti 50–60). Today, not only the Internet has become a platform for the distribution of filmic mockumentaries, but it also harbours “multigeneric web mockumentary projects … that feature traditional forms of mockumentary video embedded in an array of other texts, feeds, and online genres” (Schaffner 204)—an example of which is Watkin Tudor Jones and Yolandi Visser’s The Die Antwoord project (Schaffner 205–6). Thus far we have seen how one of the main features of mockumentary is to adopt aesthetics proper of the factual production in order to confer the “look” of a documentary to a traditional narrative. Still, this is not the only characteristic shared by all the texts that can be labelled as mockumentaries. Indeed, although in theorising this hybrid form the attention has been mostly paid to its use of factual aesthetics, the mockumentary style does not consist solely in the adoption of documentary codes and structures; it also comprises the deployment of fictionality clues, that is to say narrative, visual and/or auditory elements, comparable to those “modal shifters” through which a speaker can draw attention to his or her actual intents (Jost 65; my translation). Such clues can be, for example, booms left “accidentally” in view, title or end credits signposting the presence of actors, glances in the direction of the camera and requests of cutting a scene or repeating a take made to the filmmaker by a character unsatisfied with what he or she said or did. Parody also can serve as a fictionality clue; yet, it is a “slippery” one, in virtue of the fact that, for it to work, as Paul Ward points out, “there must … be a high level of audience ‘recognition’, of both the original material and the extent to which the parody diverges from it” (68), or else the viewers might overlook its presence. Once again, it is through the presence of such clues in animated mockumentaries that their being an integral part of this narrative style becomes evident. Indeed, whereas in hoaxes or in credible live-action mockumentaries their occurrence can be justified by the aforementioned necessity of alerting the viewer to the films’ fictionality, in these animated texts they would be redundant, if used just for such purpose. Indeed, as seen earlier, the presence of animation alone already prevents viewers from putting in place a “documentarizing reading” (Odin 229). However, if we consider Surf’s Up, we will see that here such clues are widely deployed throughout the entire film. 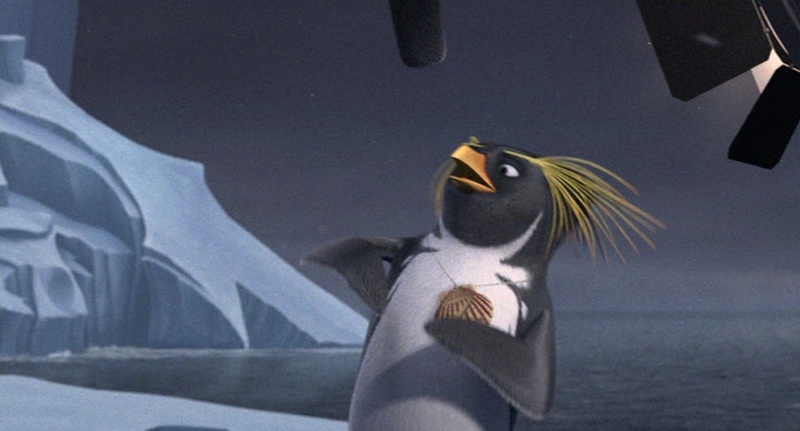 Not only a boom or part of the lighting equipment often appear in the frame, highlighting the film’s staged nature, but we can also find scenes that the camera following Cody could not have ostensibly caught, the most evident of which is the one showing the thoughts crossing the mind of the young penguin when starting the competition—indeed, needless to say, no live-action camera can yet chronicle mental processes. Moreover, there are sequences in which a character acknowledges the presence of the crew’s members by posing them a question or by throwing objects in the direction of the camera lens. This occurs for example when Big Z hurls some shells at the camera in order to discourage the crew from filming him. Figure 10: Boom and light equipment left in the frame during the initial interview to Cody. Surf's Up. Sony Pictures Home Entertainment. 2007. Screenshot. The presence of fictionality hints in audiovisual works such as Surf’s Up or these two The Simpsons episodes, where they are unnecessary to reveal the text’s ontological status, proves that practitioners and viewers perceive such clues as integral part of the mockumentary style. And they certainly are, if we consider that, paradoxically, in animated mockumentaries, just as the use of documentary aesthetics, they too serve to remind us that we aren’t simply viewing a conventional animated text, but rather one shot in a mockumentary style. In other words, they too contribute to acknowledge the presence of the fictional camera and of the crew that is scrutinising the life of these imaginary characters, and consequently to produce the impression that we are watching a documentary about them. Furthermore, it is by means of such hints and not through the adoption of the “documentary look” alone that a mockumentary reflects upon the factual audiovisual production. Certainly, as Roscoe and Hight already outlined in Faking It, “any mock-documentary text, because it ‘violates’ the proper use of documentary codes and conventions contains an inherent … latent reflexivity” (53). Nevertheless, it is by means of the fictionality clues that a critique to specific documentary features and assumptions is carried out. For instance, the fact that Big Z, immediately after a discussion with Cody, underlines his awareness of being scrutinised by a camera through asking the crew members if they like barbecues passes comment on Robert Drew and Richard Leacock’s idea that, during a critical situation, a subject tends to forget the presence of the filmmaker and act naturally (Mamber 120–1). Similarly, when in “Springfield Up” Homer tells Decland he should try not to sound so surprised at what he just heard, as it is their fifth take of that scene, amounts to a critique of the fact that often, contrary to their claims, documentaries lack in spontaneity. 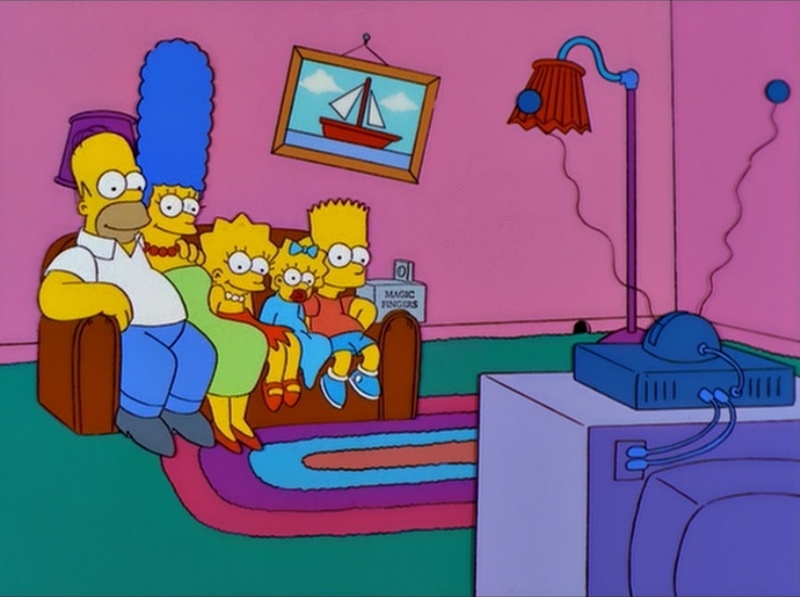 When instead, in the same episode, Homer warns Decland not to put the shot wherein he is shown tending his two children Bart and Lisa after the one in which he stated that he would have never had kids, because “that would be a devastating editing”, the validity of David Maysles’s assertion that it is possible for a filmmaker to not “impose anything” to the people he films is being questioned (qtd. in Bruzzi, New Documentary 76). Indeed, it is here made obvious that, just by recurring to montage, a director always ends up shaping the meaning of his or her movie and, therefore, that “any documentary, including observational ones, testifies to the absence rather then the presence of purity at its heart” (78). Generally speaking, what emerges is thus that, unlike what suggested by Hight in his essay “Beyond Sobriety: Documentary Diversions”, it isn’t true that the more “playful” mockumentaries, among which the animated ones would certainly fall, do not develop “an explicit critique or commentary” on nonfiction filmmaking theories and modes of representation (203). On the contrary, even in those audiovisual works in which the mockumentary style is adopted mainly with the purpose of revitalising a classic story or an abused genre, as is the case of the animated texts here analysed, through such fictionality clues comment is passed on a range of issues concerning the documentary. Although dismissed by scholars—probably on account of the anomalous communicative pact that they establish with the viewer, as shown by this brief overview of some exemplar cases—animated mockumentaries are, on the contrary, a valuable resource in gaining a better understanding of the main traits of the mockumentary in general. Precisely in virtue of their peculiarity, the fact that in them we can find both the deployment of documentary aesthetics and of fictionality clues constitutes a telling confirmation that the latter are as integral part of this narrative style as the former. However, this is not the only reason why, when addressing the cross-pollination of animation and documentary, scholars should not neglect such audiovisual works. Indeed, their flourishing in parallel with the better studied animated documentary opens up far-reaching questions on the evolution of animation production, as it seems to suggest that we are witnessing the progressive development of an animated docufiction realm alongside the already prominent live-action one. As hinted by Honess Roe in relation to the growth of the animated documentary, the increasing use of animation in the creation of documentary-fiction hybrids might simply be due to recent technological advancements and to the availability of cheaper animation tools, or even to the fact that cross-pollinating cartoons and documentary “has become a ‘trend’” (“The Evolution of Animated Documentary” 179–89). Yet, such boom could as well be read as an extreme reaction to what Brian Winston refers to as “the digital’s destruction of photography’s evidential pretentions” (12). Indeed, this blossoming of an animated docufiction has arisen when, with the shift from film to digital, the certainty of the photographic image as indisputable evidence of a profilmic occurrence, around which for decades we have shaped our belief in the visual accounts provided by nonfiction films, has definitively collapsed. Therefore, the choice of coalescing two extremes of the audiovisual production, such as documentary and animation, seems to be a way for filmmakers to ask the question: if live-action images can now lie, why not aim for some sincerity by adopting a medium (such as animation) that overtly foregrounds its own constructedness? This is, for example, the case of Brett Morgen’s Chicago 10: Speak Your Peace (2007), Ari Folman’s Waltz with Bashir (Vals Im Bashir, 2008), and Laurent Boileau and Jung’s Approved for Adoption (Couleur de peau: miel, 2012). This series, which was the recipient of the Children’s BAFTA Drama Award in 2012, is based on a partly animated short mockumentary titled Badly Drawn Roy (Alan Shannon, 2004). For an overview of the different codes and conventions and of how they operate as veridictive marks see Roscoe and Hight, Faking It 15–23. For a treatise on the notion of veridiction applied to cinema and for an account of audiovisual documentary’s modes of representation see, respectively, Bettetini 61–96 and Nichols. I.e. “to construct an Enunciator who functions as a real origin” and therefore “to take seriously, in reality, what he is offered to watch” (229–30; emphasis in original). I’m here referring respectively to Meet the Small Potatoes, Stickman and The Toll. For an account of how the film was made see also Maverick. As, up to date, no empirical audience research has been conducted on Surf’s Up, the attention will be here focused on that segment of viewers whose reactions we do instead have an account of through their reviews: the film critics. A realistic feeling has been pursed also by having the actors record the voices not singularly, as it normally happens, but rather in group sessions. It must also be noted that, interestingly, both in this essay and in a paragraph of his Television Mockumentary, where he briefly addresses non-comedic mockumentaries, Hight does use the notion of style in relation to mockumentary, but only as one of the possible “patterns” of what he still more broadly defines a “discourse”. See Television Mockumentary 23–5; “Experiments in Parody and Satire” 73–5. For instance, as underlined by Osmond, the same moral was proposed in John Lasseter’s Cars (2006) (78). Something similar had already been done two years earlier in the aforementioned “Chef Aid: Behind the Menu”, which, however, as noted by Roscoe and Hight, “is a less sophisticated mock-documentary” (Faking It 201). In relation to this second episode, it must also be noted that the character of Desmond represents an element of continuity, rather than of discontinuity, with the rest of the series, in virtue of the fact that this isn’t his first appearance in The Simpsons. On the contrary, he had already starred in previous episodes, such as “Fat Man and Little Boy” (Mike B. Anderson, 2004). For an in-depth discussion of Forgotten Silver as a hoax see Roscoe and Hight, “Forgotten Silver” 171–86; Formenti 115–25. For Dark Side of the Moon see Taylor 92–8. “28 Up.” Seven Up. ITV, London. 20 November 1984. Television. Aesop’s fables. Trans. Laura Gibbs. Oxford: Oxford U.P., 2002. Print. Alter, Ethan. “Surf’s Up.” Film Journal International 110.7 (2007): 102–3. Print. Badly Drawn Roy. Dir.Alan Shannon. JAM Media, 2004. Film. Bambi. Dir. David Hand. RKO, 1942. Film. “Behind the Laughter.” Dir. Mark Kirkland. The Simpsons. Fox, Los Angeles. 21 May 2000. Television. Behind the Music. VH1, United States. 1997–2004. Television. Bertetto, Paolo. “Stile.” L’intertestualità: Lezioni, lemmi, frammenti di analisi. Eds. Giulia Carluccio and Federica Villa. Turin: Kaplan, 2006. 78–89. Print. The Blair Witch Project. Dir. Daniel Myrick and Eduardo Sánchez. Artisan Entertainment, 1999. Film. Bruzzi, Stella. New Documentary. 2nd ed. London: Routledge, 2006. Print. ---. Seven Up. London: British Film Institute, 2007. Print. Bettetini, Gianfranco. L’occhio in vendita. Venice: Marsilio, 1985. Print. Buccheri, Vincenzo. Lo stile cinematografico. Rome: Carocci, 2010. Print. Cars. Dir. John Lasseter. Pixar, 2006. Film. Catsoulis, Jeanette. “Birds on Boards.” The New York Times 7 June 2007. Web. 3 Apr. 2014. < http://www.nytimes.com/2007/06/07/movies/08surf.html?_r=0>. “Chef Aid: Behind the Menu.” South Park. Comedy Central, United States. 7 Oct. 1998. Television. Chicago 10: Speak Your Peace. Dir. Brett Morgen. Roadside Attractions, 2007. Film. Cinderella. Dir. Clyde Geronimi, Hamilton Luske and Wilfred Jackson. RKO, 1950. Film. Colombo, Fausto. “Leonard, o del falso: nota su Zelig di Woody Allen.” Comunicazioni sociali 6.1 (1984): 49–58. Print. Couleur de peau: miel [Approved for Adoption]. Dir. Laurent Boileau and Jung. Mosaïque, 2012. Film. Debruge, Peter. “Fowl Play in Surf’s Up.” Variety June 2007: 20, 29. Print. Dobson, Nichola. “Nitpicking The Simpsons: Critique and Continuity in Constructed Realities.” Animation Journal 11 (2003): 84–93. Print. “Fat Man and Little Boy.”Dir. Mike B. Anderson. The Simpsons. Fox, Los Angeles. 12 Dec. 2004. Television. Forgotten Silver. Dir. Costa Botes and Peter Jackson. TVNZ, 1995. Film. Formenti, Cristina. Il mockumentary: la fiction si maschera da documentario. Milan: Mimesis, 2014. Print. Furniss, Maureen. Art in Motion: Animation Aesthetics. 1998. New Barnet: John Libbey, 2007. Print. Happy Feet. Dir. George Miller. Warner Bros, 2006. Film. Hight, Craig. Television Mockumentary: Reflexivity, Satire and a Call to Play. Manchester: Manchester U.P., 2010. Print. ---. “Experiments in Parody and Satire: Short-Form Mockumentary Series.” Too Bold for the Box Office: The Mockumentary from Big Screen to Small. Ed. Cynthia J. Miller. Plymouth: Scarecrow, 2012. 73–89. Print. ---. “Beyond Sobriety: Documentary Diversions.” The Documentary Film Book. Ed. Brian Winston. London: British Film Institute, 2013. 198–205. Print. Honess Roe, Annabelle. The Animated Documentary. London: Palgrave Macmillan, 2013. Print. ---. “The Evolution of Animated Documentary.” New Documentary Ecologies: Emerging Platforms, Practices and Discourses. Eds. Kate Nash, Craig Hight, and Catherine Summerhayes. 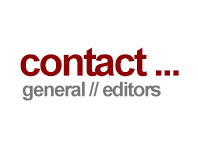 London: Palgrave Macmillan, 2014. 174–91. Print. Jost, François. Realtà/Finzione. L'impero del falso. Trans. Rosa Pavone. Milan: Il Castoro, 2003. Print. Juhasz, Alexandra, and Lerner, Jesse. Introduction: Phony Definitions and Troubling Taxonomies of the Fake Documentary. F Is for Phony: Fake Documentary and Truth’s Undoing. By Juhasz and Lerner. Minneapolis: U. of Minnesota P., 2006. 1–35. Print. The Lion King. Dir. Roger Allers and Rob Minkoff. Buena Vista, 1994. Film. Madagascar. Dir. Eric Darnell and Tom McGarth. Dreamworks, 2005. Film. Mamber, Stephen. Cinema Verite in America: Studies in Uncontrolled Documentary. Cambridge: The MIT Press, 1974. Print. La Marche de l'empereur [March of the Penguins]. Dir. Lu Jaquet. Buena Vista International, 2005. Film. Maverick, Cody. Surf’s Up: The Art and Making of a True Story. San Rafael: Insight, 2007. Print. Meet the Small Potatoes. Dir. Josh Selig. Universal, 2013. Film. 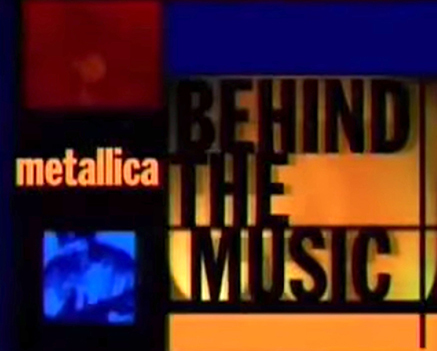 “Metallica.” Behind the Music. Dir. Michael McNamara. VH1, United States. 1998. Television. Mittell, Jason. “Cartoon Realism: Genre Mixing and the Cultural Life of The Simpsons.” Velvet Light Trap 47 (2001): 15–28. Print. Nichols, Bill. Introduction to Documentary. 2nd ed. Bloomington: Indiana U.P., 2010. Print. Odin, Roger. “A Semio-pragmatic Approach to the Documentary Film”. The Film Spectator: From Sign to Mind. Ed. Warren Buckland. Amsterdam: Amsterdam U. P., 1995. 227–35. Print. The Office. BBC2, United Kingdom.2001–2003. Television. Opération Lune [Dark Side of the Moon]. Dir. William Karel. Point du Jour, 2002. Film. Osmond, Andrew. “Surf’s Up.” Sight & Sound 17.9 (2007): 78–9. Print. Quinn, Anthony. “Surf’s Up.” Independent 18 Aug. 2007: 9. Print. Robertson, Barbara. “The Secret Life of Penguins.” Animation 21.7 (2007): 12–14. Print. Roscoe, Jane, and Hight, Craig. Faking It: Mock-Documentary and the Subversion of Factuality. Manchester: Manchester U.P., 2001. Print. ---. “Forgotten Silver: A New Zealand Television Hoax and its Audience”. F Is for Phony: Fake Documentary and Truth’s Undoing. Eds. Alexandra Juhasz and Jesse Lerner. Minneapolis: U. of Minnesota P., 2006. 171–86. Print. Roy. RTÉ, Dublin. 2009–present. Television. The Rutles: All You Need Is Cash. Dir. Eric Idle and Gary Weis. NBC, 1978. Film. Schaffner, Spencer. “Epilogue: Mockumentaries Meet New Media.” Too Bold for the Box Office: The Mockumentary from Big Screen to Small. Ed. Cynthia J. Miller. Plymouth: Scarecrow, 2012. 201–12. Print. Seven Up. Granada, United Kingdom. 1964–present. Television. The Simpsons: The Eleventh Season. 20th Century Fox Home Entertainment. 2008. DVD. “Springfield Up.” Dir. Chuck Sheetz. The Simpsons. Fox, Los Angeles. 18 Feb. 2007. Television. Stickman. Dir. Jack Bennett. Jonathan Dodgson, 2013. Film. Surf’s Up. Dir. Ash Brannon and Chris Buck. Sony Pictures Home Entertainment, 2007. DVD. “Surf’s Up.” Pressbook. Sony Pictures Releasing, 2007. Print. Taylor, Henry M. “More than a Hoax: William Karel’s Critical Mockumentary Dark Side of the Moon.” Post Script, 26.3 (2007): 92–8. Print. “These Surfer-dude Penguins Are on a Roll”, Evening Standard 3 Aug. 2007: 32. Print. The Toll. Dir. J. Zachary Pike. Hatchling, 2006. Film. Turner, Chris. Planet Simpson: How a Cartoon Masterpiece Documented an Era and Defined a Generation. London: Ebury, 2004. Print. Vals Im Bashir [Waltz with Bashir].Dir. Ari Folman. Sony Pictures, 2008. Film. Ward, Paul. Documentary: The Margins of Reality. London: Wallflower, 2005. Print. “War of the Worlds.” Dir. Orson Welles. The Mercury Theatre of the Air. CBS, United States. 30 Oct. 1938. Radio. Welles, Paul. Understanding Animation. London and New York: Routledge, 1998. Print. ---. Animation: Genre and Authorship. London: Wallflower, 2002. Print. Winston, Brian. Introduction: The Documentary Film. The Documentary Film Book. By Winston. London: British Film Institute, 2013. 1–29. Print. Formenti, Cristina. “When Imaginary Cartoon Worlds Get the ‘Documentary Look’: Understanding Mockumentary Through Its Animated Variant.” Alphaville: Journal of Film and Screen Media 8 (Winter 2014). Web. ISSN: 2009-4078. Cristina Formenti is a PhD candidate in Film Studies at Università degli Studi di Milano, where she is conducting a research project on the Italian way to animated documentary. Her research interests include all forms of docufiction, with particular focus on mockumentary. On this topic, she has authored the monograph Il mockumentary: la fiction si maschera da documentario (Mimesis, 2014) as well as a number of essays. She has also published an article on animated documentary in Studies in Documentary Film.